This is not a cleaning problem!!! Fukushima city should have been evacuated (a long time ago), not decontaminated. Everybody knows the decon doesn’t work, everybody rolls with their fingers crossed. Everybody knows the war is over, everybody knows the good guys lost. But so it goes, and everybody knows. Or not. Maybe not these 110 volunteers from all over the country with good intentions, who chose to go to one of the very high radiation area (Onami District) in Fukushima City in Fukushima Prefecture to do the decontamination work. As you see in the photo by Yomiuri Shinbun, the district is in the mountains. Radioactive materials will continue to come from the mountains, no matter how (and how many times) they “decon” the roads and houses. 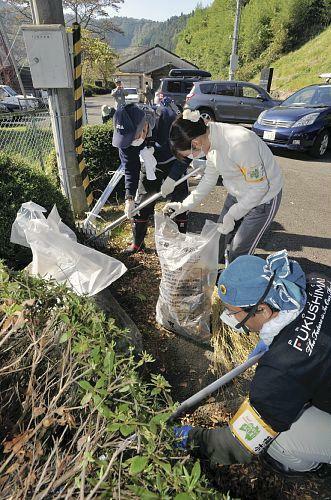 On October 29, decontamination work started in Onami District in Fukushima Prefecture with volunteers and the residents participating. The city plans to decontaminate the entire 110,000 households in the city. Onami District is the first to be decontaminated, and the contractors hired by the city have been working since mid October. However, the city felt it was difficult to proceed only with the government effort, and decided to call for volunteers. Today, 110 volunteers that applied for the work and the area residents participated. They would do the work in the locations with relatively low radiation. After fitted with gloves, masks and personal survey meters, they went to the private residences or public meeting halls whose roofs and walls had been already washed by the contractors with pressure washers. They collected dead leaves, removed weeds, and put in new soil where the surface of the soil had been removed. From what I see in the photo, this “decon” looks no different from the one I posted on October 26, calling the house and yard cleaning “decontamination”. The difference is that there are radioactive materials in the soil, on the stones, on the house, everywhere, which the flimsy masks and work gloves do not block. But the volunteers can feel good about themselves for their hard work, the residents can feel as if they’ve reduced the radiation, and the city and the prefecture and the national government save a good chunk of money. Win-win for everyone. I personally think it is unconscionable for the city to call for volunteers who are in no way trained in any kind of proper decontamination technique (if there is such a thing, that is). And to have a woman in the child-bearing age , like the one Yomiuri interviewed, do the work like this is totally beyond me.